What a crazy day today! In the midst of teaching theme, we had a lockdown that basically lasted from 11:30 till 3:00. Police escorting the buses at dismissal. Pretty sure we made the national news. Craziness. ANYWAY. So the subject was theme today. 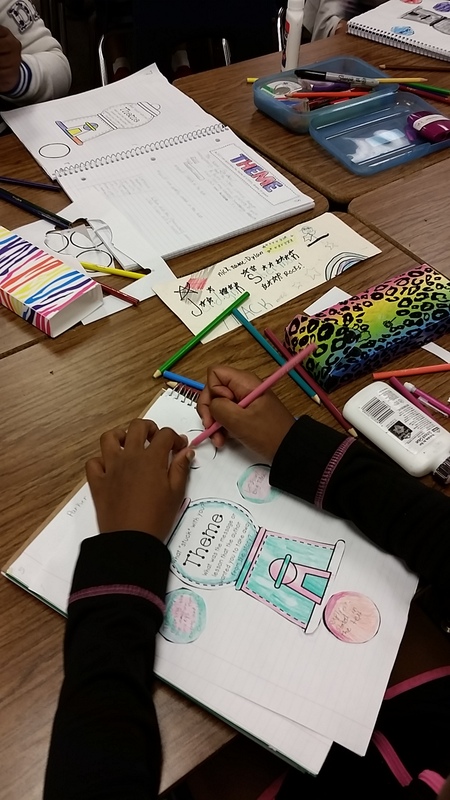 On my side I gave direct instruction with guided notes about theme. I started with a humorous hook of fables and their morals. Humorous, you ask. In a room full of fifth graders, it gets rather giggly when you are reading about the Donkey and the Lion’s Skin. Just remember, when Aesop was writing, they didn’t call them donkeys. After the right side notes, I gave them some cutouts from Grade 5 Reading Notebook by Nicole Shelby. They were a gumball machine and five gumballs. The gumball machine has the definition of theme formed as a question on it. The idea is that just as blowing too big of a gumball can create a sticky situation, theme is what sticks with you after you read. That idea gets carried through to the gumballs. On their side, the processing side, they had to look back over their notes and pick the five things that needed to stick with them from the information. This forces them to prioritize the notes. To do that, they really need to think them through. Today’s hiccup…Apparently there isn’t a whole lot of new material in the 5th grade version compared to the 4th grade version. A portion of the kids who all had the same 4th grade teacher said they had these same cutouts last year. I thought maybe the teacher had been challenging her students with the 5th grade book. But alas, she told me she has the 4th grade version. I’m hoping it doesn’t all repeat. 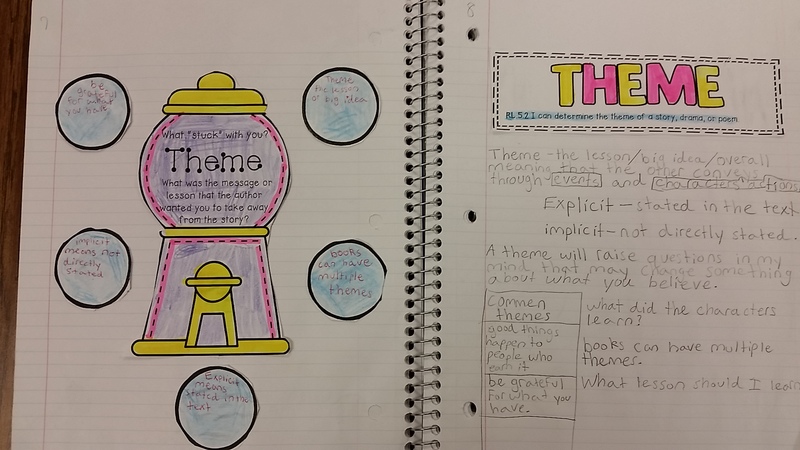 Posted on August 27, 2014 by sslateacher	• This entry was posted in Uncategorized and tagged 5th grade, education, ELA, interactive student notebooks, middle school, theme. Bookmark the permalink.